Experts Aghast At Russian Claim Of Nuclear-Powered Missile With Unlimited Range : Parallels The U.S. tested similar concepts in the 1960s but abandoned them over concerns of radioactive contamination. Russia's claim seems so fantastic that some analysts didn't believe initial reports. Russian President Vladimir Putin discussed the new missile during his annual state of the nation address in Moscow on Thursday. 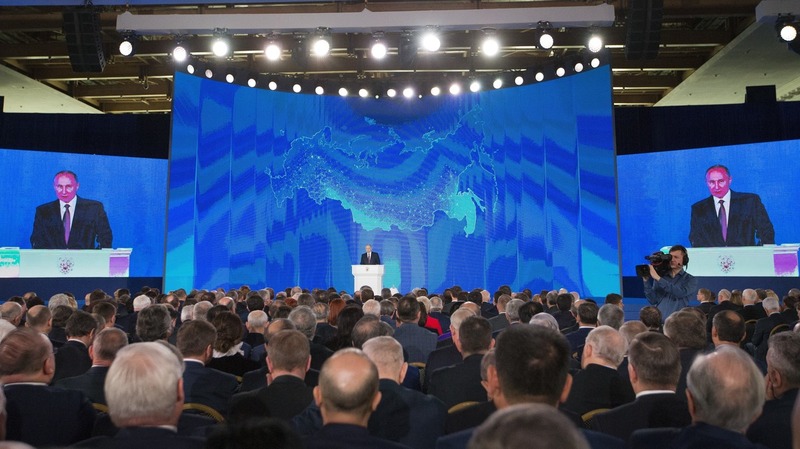 In his annual state of the nation address on Thursday, Russian President Vladimir Putin unveiled a nuclear-powered, nuclear-armed cruise missile that he claimed could fly indefinitely and deliver a warhead to any point on the earth's surface. The weapon seems so fantastical that some analysts simply didn't believe the initial reports of the missile that appeared on social media early Thursday. "I had my doubts," says Pavel Podvig, who runs the Russian Strategic Nuclear Forces blog. Podvig thought that perhaps something was lost in translation. But after watching the speech for himself on YouTube, he realized Putin had really made the claim: "Apparently, that's what he said." According to Putin's prepared remarks to the Russian Federal Assembly, he said that "in late 2017, Russia successfully launched its latest nuclear-powered missile at the Central training ground. During its flight, the nuclear-powered engine reached its design capacity and provided the necessary propulsion." An accompanying video appears to show a cruise missile launching into the sky and hurtling through the air. An animation then shows how such a weapon could dodge terrain and missile defenses while flying for thousands of miles around the tip of South America and toward the U.S. West Coast. "I'm still kind of in shock," says Edward Geist, a researcher specializing in Russia at the Rand Corp. "My guess is they're not bluffing, that they've flight-tested this thing. But that's incredible." The U.S. designed and built a nuclear-powered missile engine during the height of the Cold War. It never flew. Nuclear propulsion is used on large ships like aircraft carriers and submarines. It allows these vessels to operate for years without refueling, dramatically extending their range and endurance. In the early days of the Cold War, both the U.S. and the Soviet Union looked into nuclear-powered aircraft as well. Both nations tried installing a nuclear reactor into a strategic bomber. But the reactors were heavy, and the crews faced risks from radiation exposure. Both countries quickly gave up on the idea. The U.S. did go on to investigate the idea of a nuclear-powered missile, Geist says. Known as the Supersonic Low Altitude Missile, the idea was more like a nuclear-powered drone aircraft. "It was actually supposed to fly around autonomously and drop nuclear gravity bombs," Geist says. The nuclear reactor that would keep SLAM aloft would also spew radioactive exhaust, Geist says. At the time, that was advertised as a feature, not a bug, because it would have had the added benefit of polluting the Soviet countryside. "It was supposed to be really, really dirty," Geist says. 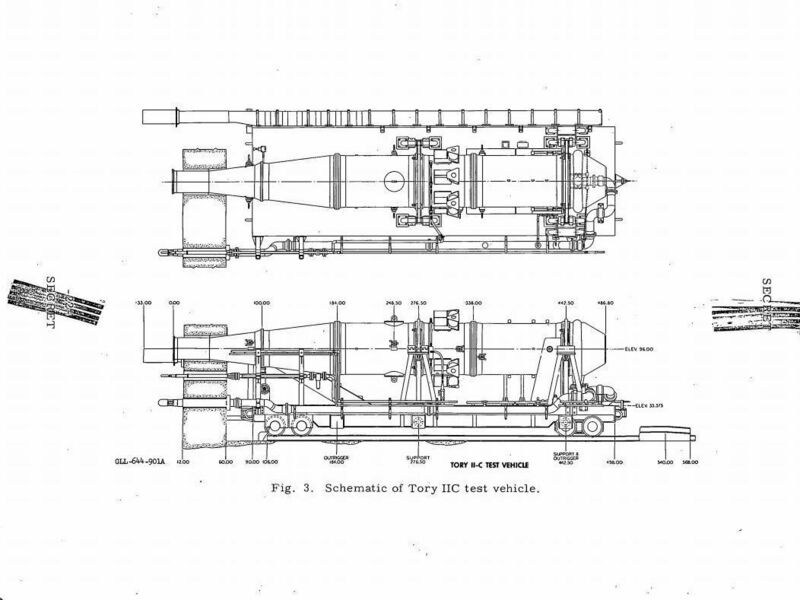 The U.S. developed plans for a nuclear-powered cruise missile in the 1950s and 1960s. But the program was abandoned. The U.S. got as far as actually building the nuclear engine for Project Pluto, a development project at the Nevada Test Site. The reactor was tested a number of times in the early 1960s, and it performed well. But by that point, awareness had grown about the dangers of nuclear fallout, and arms control treaties were coming into place, Geist says. Those concerns were among the reasons the project died in 1964. The type of reactor used in Project Pluto was particularly messy because it exposed the nuclear fuel directly to the outside air. Geist says the new Russian missile may use a different system that keeps the fuel somewhat isolated from the air. But, he quickly adds, that wouldn't make it safe. "There are a bunch of different ways to do it, and frankly, they're all terrible," Geist says. He suspects that the Russian design would involve what's known as a "fast reactor," which is more efficient, but also less safe, than most nuclear reactors. If the missile crashed or the reactor failed, it would trigger a major incident. "It's just crazy they field-tested this thing," he says. Russia, even without these weapons, has the capability to reduce the U.S. into a pile of radioactive soot. The test is just one of several unconventional systems Putin mentioned in his Thursday speech. The Russian president also discussed "hypersonic" weapons that could maneuver through missile defenses and a nuclear-powered underwater torpedo, which some believe could be used as a doomsday weapon. The strategic value of all these new nukes is somewhat questionable, says James Acton, a nuclear expert at the Carnegie Endowment for International Peace. "Russia, even without these weapons, has the capability to reduce the U.S. into a pile of radioactive soot," he says. Acton says he believes the new missile is designed to send a message that Russia is a strong, technologically capable country. Russia has also been worried about the development of U.S. missile defenses. While American officials say the U.S. system is mainly designed to protect against a limited attack from North Korea, the Russians believe it could be used against them as well. "They think our missile defenses are much more effective than we think our missile defenses are," Acton says. President Trump's budget is requesting $12.9 billion for missile defense programs in the coming year. That money will go toward new radars and additional interceptors. Geist says he expects Russia's provocations to continue. "They're sending us a message that they are not OK with our U.S. missile defense posture," he says. That message? "They're willing to go full Strangelove on us," Geist says.